A wonderful little bunny for your Spring & Easter decorating! Made from plush felt, painted and distressed for a timeworn look. The bunny wears simple clothing and holds a cute little sign advertising her egg delivery service... "Easter Eggs Delivered Daily". She is not freestanding...she is a stump doll. She can be propped against something or tuck her into an old crock, basket, bowl or just about anywhere! 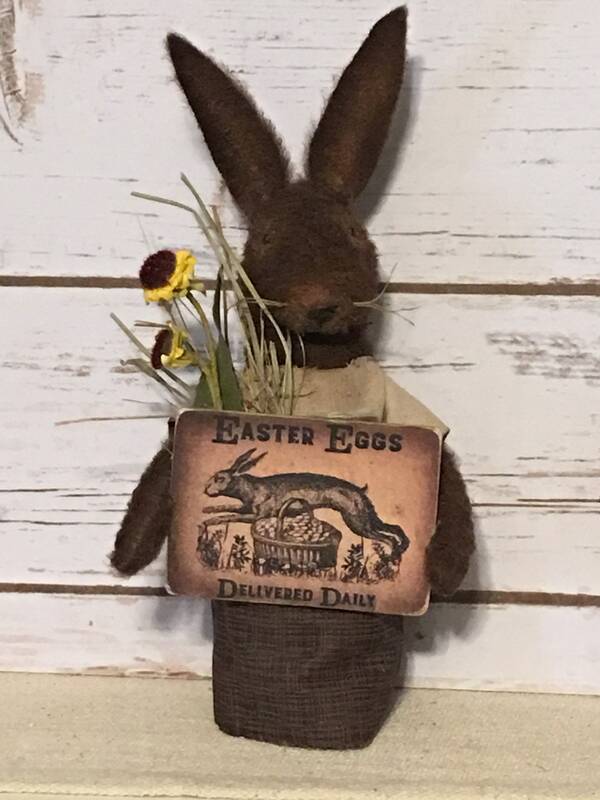 Handmade by Daisy Patch Primitives...pattern by "Cinnamon Creek Folkart". This little bunny is made and ready to ship! Please allow 3 days for delivery. My sister in law loves Halloween 🎃. This is for her birthday and it just so happens they added a new black cat to their family . She’s going to love this ! !